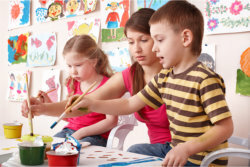 We encourage our children to explore there creativity and Imagination through our art and craft programs. Here they will be able to explore their originality, and talent with simple projects all while having fun. Your child will not only horn their skills but will also have a great time. With exposure to various types of arts and craft the children develop their own individual craftsmanship interest. They begin the process of communicating visually who can then go on to develop and enhance their skills and talent.